Office Space Planners uses Crazy Fingers to write and produce media-specific print campaigns. This campaign was for placement in the Oregon State University Alumni Magazine. AD #1 COPY: Relocation Approaching Expeditiously? The nice thing about advertising to fellow OSU alumni ... We can use the big words. AD #2 COPY: Need More Trophy Space? 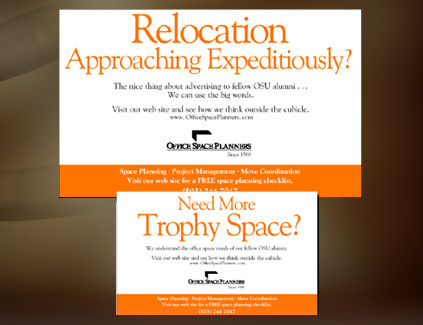 We understand the office space needs of our fellow OSU Alumni.